Anne Lockhart on Zhivago in the Colorado Celebrity Rodeo. This was a few years ago when Zhivago was all over the place making a name for himself. He has passed on now and his clone-son continues to breed on the Stockton/Burton Ranch. Zhivago is ITLA registered and ITLA AI Enrolled. A bull can be AI Enrolled in either association and calves can be registered in both associations. Anne Lockhart first became known in the film Battlestar Glactica as Sheba. Later she appeared in Tangled, Osmosis Jones, Total Recall, Project X, Troll and Young Warriors. 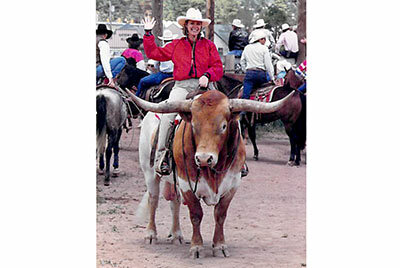 Anne spends a lot of time in Texas and is an appreciator of Texas Longhorn cattle.